6. No commission shopping stops. The cost is 450RMB (about 75 US$) per person. It includes transportation, entrance fees, water, lunch and guides. We give 10% discount for members and kids under 12’s. We will meet at 8:00am and it will take us about 2 hours to get to the long-valley castle village. We will first explore the Long Valley Castle village, where was an old castle. The garrisons manning the nearby section of the Great Wall lived there. We will stroll through the village, passing under a few old castle gates and several parts of defensive walls, looking at old shrines and a temple with a big old tree. Then we will begin to hike to the highest Great Wall beacon tower on the mountain summit. There are stunning views along the way and on the mountain summit. 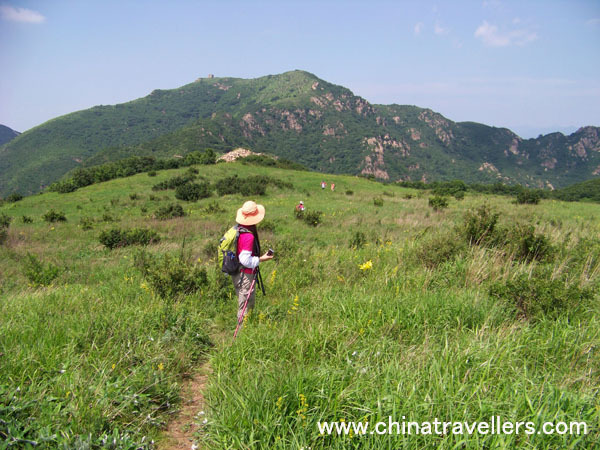 We will pass by a reservoir, a small forest, a jungle corridor, a tablet which marks the border of Beijing Municipality and Hebei Province, the Round Stone Mound, a large piece of meadow and then arrive at the highest beacon tower of the Great Wall around Beijing with the sea-level of 1400 meters. We will stay on the tower taking some pictures, enjoying the beautiful wide review around, and then return to the village. We will have a late lunch at a local farmer’s guest house after the hike. We will email you 2-3 days before the hike to let you know about the weather condition. If there is thunder storm, heavy rain or strong wind it will be dangerous to do the hike on the wild unrestored Great Wall in the mountains. So we will cancel it, change the dates or arrange a hike to the restored section of the Great Wall. What to bring on this hike? 4. Comfortable sport shoes (hiking boots are strongly suggested). These hikes usually involve a lot of walking, climbing and descending over varied terrain, and sometimes also camping. The elevation is about 1000 meters and the length ranges from 10 to 15 kilometers. Some roads/trails can be a little rough. The hiking time is usually somewhere between 4 and 6 hours. People with acrophobia shouldn’t join these kinds of hikes. For whom are Level 4 hikes suitable? People who are fit and healthy, doing aerobic type exercise regularly and have prior hiking experiences. What is included on this hike? What is excluded on this hike? In addition to our regular weekly hikes, we also offer private tours. You can customize a private hike for you, your family or your friends exclusively. Just tell us what you want and we will organize a hike for you, with places, guides, transport, food, and accommodation all taken care of. You can make a private reservation on the private tour page. 1. A private tour is more flexible. Both extra distance and less distance are available. 2. Discounts are available for larger groups. 3. Prices are quoted in Chinese dollars. 1. There are risks involved in outdoor activities. Please read our Risk Acknowledgment and Waiver and inform yourself before participating. 2011 chinatravellers.com.All rights reserved. No content can be used without written permission.